Click here for rehearsal photos. 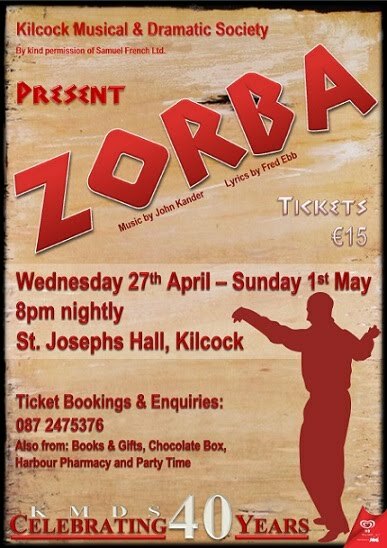 KMDS present their 40th anniversary and 20th musical production ZORBA by Kander & Ebb. Tickets priced at €15.00 available from kilcockms@gmail.com or 087 2475376, or locally from Books & Gifts, The Chocolate Box, Harbour Pharmacy and Party Time. The setting is Crete in 1924. Nikos, a young student, has inherited a mine which he plans to resurrect to its working state. With his new friend, Zorba, he travels from Piraeus and lodges with a French woman, Hortense. It soon becomes apparent that Zorba and Hortense are attracted to each other and there soon becomes a romantic involvement. Zorba tries to get Nikos interested in a young Widow who brings them lunch but Nikos treads wearily. Zorba is very much his own man and a law unto himself. Nikos has given him money with which to buy supplies to enable them to reopen the mine but Zorba goes off and spends it all on a belly dancer. Hortense, meanwhile is romantically dreaming of marriage with Zorba - and a wedding ring! Despite his misgivings Nikos plucks up his courage and goes to visit the Widow. Their meeting is witnessed by a young man, Pavli, who is somewhat mentally unbalanced. Resulting from witnessing the assignation of the Widow and Nikos, Pavli kills himself. Next morning, village celebrations are stilled when Pavli's body is discovered. Zorba returns to the village with no supplies for the mine, no money and no wedding ring for Hortense. Nikos tells the Widow how much she means to him - and the feelings are reciprocated. But their love comes too late. A member of Pavli's family stabs her to death, blaming her for Pavli's suicide. The bad news does not stop here. A survey of the mine shows that it has been closed too long and that it will be impossible to reopen it. Zorba is a philosophical man, but Nikos cannot understand Zorba's attitude to those who killed the Widow. Zorba explains that one must accept death as one accepts life, all there is left to do is dance. Hortense has become very ill and in her delirium, she imagines she is a young girl again. Zorba rushes to her side but to no avail. Nikos and Zorba, in their mutual grief, begin to dance. Nikos decides to return to Athens - and Zorba to wherever life leads him. We look forward to seeing you in St. Joseph's Hall for what promises to be a fantastic show to celebrate our 40th Anniversary.